Canadians will have to pay a lot to get the best, but the Galaxy S7 edge is a true flagship in every sense of the word. For the second time in two years, Mobile World Congress brought two new Galaxy S flagships, but for the first time they are different sizes. And unlike what you'll find in the U.S. (and a couple other countries), this Canadian Galaxy S7 edge is powered by something other than a Qualcomm Snapdragon processor. A passerby to this industry would be forgiven for confusing the specifics of 2015's Galaxy lineup, but in retrospect it's a comfort to be able to say they were all superb products. Now, with the 5.1-inch Galaxy S7 and 5.5-inch Galaxy S7 edge, Samsung has even further honed its hardware craft, returning two consumer-favorite features — the microSD slot and waterproofing — while bumping the software to Google's latest. To this Canadian, the Galaxy S7 edge is the true flagship, and will be the focus of this review. There are some subtle differences between the GS7 and its larger edge counterpart — the size of the battery, and the curvature of the screen — but to my eyes, the S7 edge is the one to focus on. This review was performed on a Telus-branded Samsung Galaxy S7 edge, model number SM-G935W8. It's on Android 6.0.1, software version G935W8VLU1APB7. We used this GS7 edge for six days in both Canada on the Telus network, and in the U.S., roaming on AT&T. The Galaxy S7 edge jumps out as being a few things right away: it's compellingly compact for having a 5.5-inch display, which is a byproduct of Samsung's ability to manufacturer the components in the phone. The 2560x1440 pixel Super AMOLED display is as good as ever, but the company has managed to increase the screen-to-body ratio by reducing the bezel area above and to the side of the screen. What does that mean in practice? This is one of the most one hand-friendly big phones I've had the pleasure of using. Samsung also takes cues from the Galaxy Note 5 in its new S7 lineup, curving the rear glass as it meets the aluminum frame on the sides. The result is ergonomic and functional, and quite attractive, especially in the Onyx Black model I have been using. Unfortunately, unless it is purchased from one of a handful of Samsung Experience stores throughout the country, that black color is the only version of the S7 edge available from Canadian carriers; the Galaxy S7 proper is being sold in both black and silver variants. Unlike the Qualcomm-powered U.S. version, Canadians will be exposed to the Exynos 8890 system-on-a-chip, the latest from Samsung's semiconductor business. Built on the same 14nm process as last year's Exynos 7420, it's clear that this new octa-core chip is powerful — the presence of a heatpipe inside the phone proves that Samsung is serious about mitigating heat output — and the S7 edge does occasionally get uncomfortably hot. But most of the time, the phone comports itself extremely well. Canadians shouldn't worry about the differences between the Exynos 8890 and the Qualcomm Snapdragon 820, which is found only in models being sold in the U.S., Japan, and China. At this point, Samsung has just about graduated to "reliable" in the mobile processor space (the entire S6 line was powered by Exynos processors), and this year's iteration is no exception. 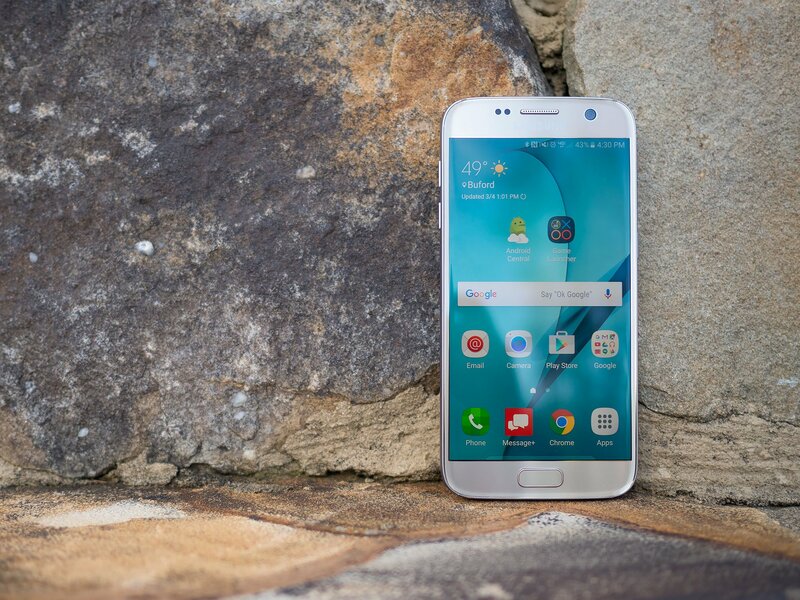 The big question is whether the Galaxy S7 edge is worth its massive price: $500 on-contract is a big ask, and puts it up there with the iPhone 6s Plus, its natural competitor, as one of the most expensive handsets on the Canadian market. Even more distressing is the $1,000 off-contract price. The hardware certainly feels expensive, but what about what's going on inside? The 12MP camera sensor is the same physical size as its Galaxy S6 counterpart, 1/2.6", but has four million fewer addressable pixels. It also captures photos at a more industry-standard aspect ratio of 4:3, which is one of a few welcome changes on the spec sheet. In practice, the new sensor, combined with a sharper, wider F1.7 lens, means that the S7 can take better photos in low light — and it's true, they are! — but my colleagues and I agree that the phone's regular camera output is actually somewhat worse than on the 2015 lineup, which included the Galaxy S6 and Note 5. Outdoor shots have a pablum of chroma noise, and at 100 percent zoom there is a distracting amount of sharpening — which looks good on the compression-friendly internet, but not when viewed on a large, properly calibrated high resolution display. No one can call the S7's camera bad, but it's more of a side-step than an upgrade over the S6. That is, unless one spends most of their time in dimly-lit indoor rooms, which is where the S7 edge truly shines. It shines elsewhere, too: battery life is much better than on the S6 edge, owing to a cell that is some 38 percent larger. Samsung may not have brought back the S5 era's removable part, but it's done everything it can to ensure the newest generation products last at least a full day, and then some. I used the heck out of this phone for a week, and didn't drop below 20 percent once before putting it back on the charger before bed. That charger can still be wireless, too, is a big plus: Samsung has maintained its ability to charge the Galaxy S7 series using either Qi or PMA standards (which will continue to be the case until the industry decides on a single standard). With the Quick Charge 2.0-compatible wired charger, the S7 edge's 3,600mAh battery cell charges in 100 minutes; with a Fast Wireless Charger, which is available from Samsung for around $80 CAD, the phone charges in 155 minutes, or just over two and a half hours. Combined with the improved battery life, the S7 edge finally feels like a well-rounded device, and fixes the most glaring issue from its predecessor, which wallowed in charging anxiety due to its 2,600mAh cell. Part of the battery life improvements are thanks to Android 6.0 Marshmallow, which, despite looking nearly identical to Lollipop on the Galaxy S6 edge, contains Google's Doze feature, which cuts down on standby battery usage. In short, leaving your phone alone for a while intelligently shuts down background processes whenever possible, extending uptime considerably. That, and Google Now On Tap, which has yet to prove itself particularly useful, stand atop a wealth of subtle improvements that Google added to Android M last year — though many devices are only now shipping with Marshmallow. TouchWiz is fine. Samsung's version of Android still has certain idiosyncrasies, but it's not the dumpster fire it once was. Instead, it's well-rounded and approachable to new users, which is considerably more than what could be said about it just a few years ago. We've already written extensive reviews for the Galaxy S7 and Galaxy S7 edge, so what (I assume) you're really interested in is what the Canadian version is like. The main difference between the Canadian and U.S. models is that the former sports an Exynos 8890 SoC as opposed to Qualcomm's Snapdragon 820. All but the most fastidious specification hounds will likely care little about the differences, but there are a couple. First, the Snapdragon's two high-performance Kryo cores perform slightly better than the Exynos's four custom M1 cores on tasks, such as web browsing, that only use a handful of cores. On the flip side, because the Exynos chip is clocked higher, and has more cores in total (eight to the Snapdragon's four), it tends to outperform in games and other CPU-intensive activities. These minor differences won't be apparent in real-world use, but you can bet the benchmarkers out there will make something of the differences. Canadians also can look forward to a nice bump in terms of network performance from the Galaxy S7 edge. Supporting theoretical speeds of 450 megabits per second, the takeaway here is that the S7 edge is highly optimized for tri-carrier aggregation, which is currently in use by Bell and Telus. This usually shows itself in a combination of Band 2, Band 4 and Band 17, with an end result in the range of 100 to 120 megabits per second down and 15 to 35 megabits up. Canada is a launch country — along with India, Spain, Portugal, Russia, Brazil, Mexico, and United Arab Emirates — for Samsung Members (also known as Galaxy Care), a service that connects GS7 owners directly with customer care representatives. The goal is to make it easier for device owners to diagnose and fix issues, either software or hardware, through a direct support channel and diagnostic tools. Finally, compared to the U.S. carrier versions, the Telus model I am using has almost no bloatware, and all of it can be disabled. Aside from the Telus "My Account" app, the GS7 edge had apps from Suretap and Amazon pre-installed. That's pretty darn clean. I've always been a reluctant Samsung user — I never enjoyed the squishy plastic of the Galaxy S to S5, and I always had trouble recommending the software. That largely changed in 2015 with the Galaxy S6 and S6 edge (and Note 5 and S6 edge+, but I digress), but there were still some issues, mainly with battery life. Now, with a larger screen, better battery, a great low-light camera, and niceties like wireless charging, water resistance, and the reintroduction of the microSD slot, the Galaxy S7 edge is, in my opinion, close to the best Android device one can buy. But it's expensive. Like, really expensive. At $500 on-contract and $1,000 outright, with no choice of a 64GB or 128GB model, it may be difficult to justify purchasing Samsung's latest flagship, even with the addition of a Gear VR headset with every pre-order. Nonetheless, no one is going to be disappointed upon using the device, and really, that's all that matters. It's 2016, and you still can't purchase the Galaxy S7 edge unlocked directly from Samsung. That speaks to the relationship the OEM has with its carrier providers, but there has been one positive change in the market recently: the opening of five Samsung Experience stores throughout the country. While you still won't be able to buy the phone unlocked, Samsung promises that if the phone is purchased outright it will offer free unlock codes. Take that for what it's worth. Elsewhere, you can expect all the major carriers to carry the device. Rogers, Bell and Telus have all priced it at $500 on-contract and $1,000 outright, and you can bet that most others will follow suit with similar schemes. Also: Read our Galaxy S7 review! The Galaxy S7 edge is a seriously great phone, but it's only half of this year's Galaxy S launch from Samsung — there's also the "standard" Galaxy S7. It's smaller and flatter, but offers much of the same experience we've covered here. It's worth learning about it to help you decide which of the two is right for you. Hit the link below for our comprehensive Galaxy S7 review. Read our GS7 review here!